As a car owner, there are many things that you can do to extend the life of your vehicle. These forms of preventative maintenance can include changing your oil, checking your tire pressure, and getting regular checkups. Preventative maintenance saves you money and helps you catch small issues before they become a big problem. Just like performing routine activities like going to the gym or taking a shower, maintaining your car takes time and effort but will ultimately benefit the health of your vehicle. For your convenience, every time you visit Broad & James AutoCare & Towing, in Columbus, OH we will check under the hood to make sure all of your vehicle’s vital fluids are in proper condition. We will then make recommendations based on these observations. Make sure you check your owner’s manual for an appropriate maintenance schedule for your specific vehicle, this will help you know when you need to bring your car in. 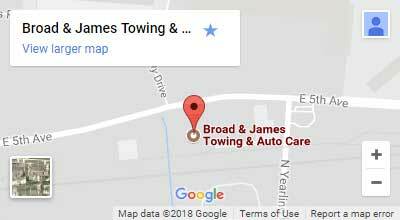 Here at Broad & James AutoCare & Towing we can help you keep your car running smoothly and safely.